Bonai Power Bank 10,000mAh Portable External Battery Charger with Flashlight and 5 Battery Cells for Apple iPhone iPad iPod Samsung Galaxy Smartphones and Tablet (White)- Always support your life. 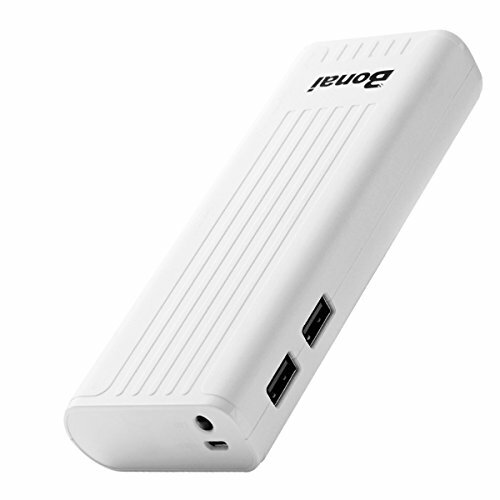 Portable handheld size (0.78*5.4*2 inches) but high capacity: 100% 10000mAh Power Bank with 5 battery cell, more stable more easy to take. Double USB Port 2Amp Output: you can freely charge of your iPhone iPad iPod Samsung Galaxy HTC and more devices at the same time now. Combined perfectly power bank and backup flashlight, you can widely use them both on camping, hiking and so on. Easy to use - Press ON/OFF button twice to turn on, and press button about twice to turn off. Supports over-charged, over-discharged, over-voltage, over-current and short circuit protection. Automatic shutdown if a short circuit or overload output occurred while unit is charging. All products from Bonai provide 30 days money back and ONE year limited warranty. Double USB Port 2Amp Output, allows for simultaneous charging of your iPad, iPhone, iPod, Android (Samsung Galaxy,ZTE,HUAWEI,HTC,LG, Pixel),Nintendo Switch and more at high speed. Please be fully charged for the first time,it may take 10-12 hours. When it fully charge, the all four lights will go out. 100% customer satisfaction, 30 days worry-free money back with One Year limited warranty. If you have any questions, please feel free to contact us directly. If you have any questions about this product by Bonai, contact us by completing and submitting the form below. If you are looking for a specif part number, please include it with your message.